MYRTLE BEACH, SC (WMBF) - If you take a stroll on the beach, chances are you might need to watch your step and it isn't because of the sea shells. 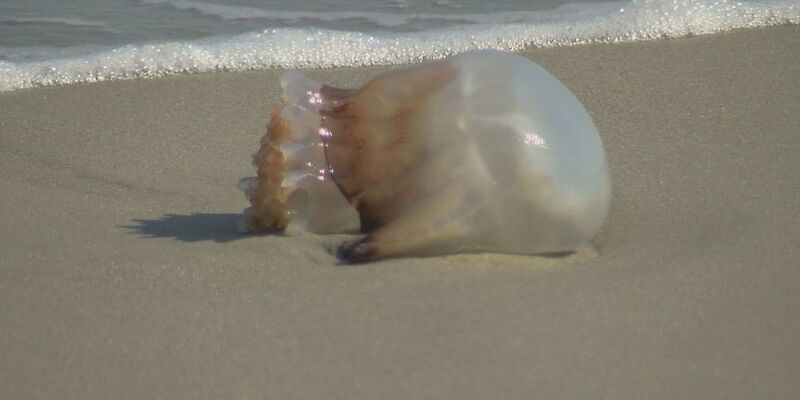 A strong onshore wind has been pushing large jellyfish to the shore. These bigger jellyfish are called cannon ball jellyfish. Luckily, these jellyfish do not sting, but we may see more stinging jellys sooner than usual. "The temperature of the water will kind of tell you when the jelly's will be here. Whether they'll be here early or late. Right now the water's a little warmer so we'll see the different types of jelly's come sooner," said Sean Boyd of Ripley's Aquarium. While cannon ball jellyfish might be annoying to swimmers, they're helpful to fisherman. "It's a good indication that there will be pretty good fishing because a lot of the fish eat jellyfish." Cannon ball Jellyfish are also bringing in leather back sea turtles on migration. To put it in perspective, these giant turtles are about the size of a Volkswagen, Jetta. "They can weigh anywhere from 500 to 1,000 pounds," said Ann Wilson, Interpretive Ranger at Myrtle Beach State Park. There's a small window of time when you can see these massive turtles. As soon as the winds change, the cannon ball jellyfish will move away from shore, and so will the leather back turtles. "Now is a great time to get onto a local fishing pier and see if you can spot one of these."